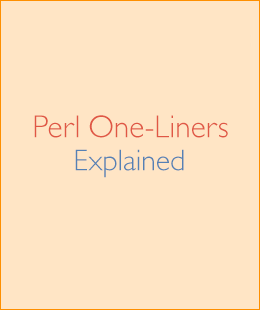 This is the fifth part of a nine-part article on Perl one-liners. In this part I will create various one-liners for text conversion and substitution. See part one for introduction of the series. 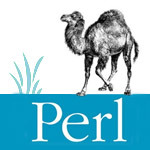 Perl one-liners is my attempt to create "perl1line.txt" that is similar to "awk1line.txt" and "sed1line.txt" that have been so popular among Awk and Sed programmers. Part IV: String creation and array creation. Part V: Text conversion and substitution (this part). After I'm done with explaining the one-liners, I'll release an ebook. Subscribe to my blog to know when that happens! This one-liner uses the y operator (also known as tr operator) to do ROT13. Operators y and tr do string transliteration. Given y/SEARCH/REPLACE/, the operator transliterates all occurrences of the characters found in SEARCH list with the corresponding (position-wise) characters in REPLACE list. If you look closely you'll notice that the second list is actually the first list offset by 13 characters. Now the y operator translates each character in the first list to a character in the second list, thus performing the ROT13 operation. The -p argument puts each of file's line in the $ variable, the y does ROT13, and -p prints the $ out. The -l appends a newline to the output. Note: remember that applying ROT13 twice produces the same string, i.e., ROT13(ROT13(string)) == string. 63. Base64 encode a string. This one-liner uses the MIME::Base64 module that is in the core (no need to install it, it comes with Perl). This module exports the encode_base64 function that takes a string and returns base64 encoded version of it. Here the -0777 argument together with -n causes Perl to slurp the whole file into the $_ variable. Then the file gets base64 encoded and printed out, just like the string example above. If we didn't slurp the file and encoded it line-by-line we'd get a mess. 64. Base64 decode a string. The MIME::Base64 module also exports decode_base64 function that takes a base64-encoded string and decodes it. There is no need to slurp the whole file into $_ because each line of a base64 encoded file is exactly 76 characters and decodes nicely. You'll need to install the URI::Escape module as it doesn't come with Perl. The module exports two functions - uri_escape and uri_unescape. The first one does URL-escaping (sometimes also referred to as URL encoding), and the other does URL-unescaping (URL decoding). This one-liner uses the uri_unescape function from URI::Escape module to do URL-unescaping. This one-liner uses the encode_entities function from HTML::Entities module. This function encodes HTML entities. For example, < and > get turned into &lt; and &gt;. This one-liner uses the decode_entities function from HTML::Entities module. 69. Convert all text to uppercase. This one-liner uses the uc function, which by default operates on the $_ variable and returns an uppercase version of it. It causes anything after it (or until the first occurrence of \E) to be upper-cased. 70. Convert all text to lowercase. This one-liner is very similar to the previous. Here the lc function is used that converts the contents of $_ to lowercase. Here \L causes everything after it (until the first occurrence of \E) to be lower-cased. 71. Uppercase only the first word of each line. The one-liner first applies the lc function to the input that makes it lower case and then uses the ucfirst function that upper-cases only the first character. First the \L lower-cases the whole line, then \u upper-cases the first character. 72. Invert the letter case. This one-liner does transliterates capital letters A-Z to lowercase letters a-z, and lowercase letters to uppercase letters, thus switching the case. 73. Camel case each line. This is a lousy Camel Casing one-liner. It takes each word and upper-cases the first letter of it. It fails on possessive forms like "friend's car". It turns them into "Friend'S Car". Which checks if the character before the word is not single quote '. But I am sure it still fails on some more exotic examples. 74. Strip leading whitespace (spaces, tabs) from the beginning of each line. This one-liner deletes all whitespace from the beginning of each line. It uses the substitution operator s. Given s/REGEX/REPLACE/ it replaces the matched REGEX by the REPLACE string. In this case the REGEX is ^[ \t]+, which means "match one or more space or tab at the beginning of the string" and REPLACE is nothing, meaning, replace the matched part with empty string. 75. Strip trailing whitespace (space, tabs) from the end of each line. This one-liner deletes all whitespace from the end of each line. Here the REGEX of the s operator says "match one or more space or tab at the end of the string." The REPLACE part is empty again, which means to erase the matched whitespace. 76. Strip whitespace from the beginning and end of each line. This one-liner combines the previous two. Notice that it specifies the global /g flag to the s operator. It's necessary because we want it to delete whitespace at the beginning AND end of the string. If we didn't specify it, it would only delete whitespace at the beginning (assuming it exists) and not at the end. 77. Convert UNIX newlines to DOS/Windows newlines. This one-liner substitutes the Unix newline \n LF with Windows newline \r\n CRLF on each line. Remember that the s operator can use anything for delimiters. In this one-liner it uses vertical pipes to delimit REGEX from REPLACE to improve readibility. 78. Convert DOS/Windows newlines to UNIX newlines. This one-liner does the opposite of the previous one. It takes Windows newlines CRLF and converts them to Unix newlines LF. 79. Convert UNIX newlines to Mac newlines. Apple Macintoshes used to use \r CR as newlines. This one-liner converts UNIX's \n to Mac's \r. 80. Substitute (find and replace) "foo" with "bar" on each line. This one-liner uses the s/REGEX/REPLACE/ command to substitute "foo" with "bar" on each line. 81. Substitute (find and replace) "foo" with "bar" on lines that match "baz". It puts each line in variable $line, then checks if line matches "baz", and if it does, it replaces "foo" with "bar" in it. Have fun with these one-liners for now. The next part is going to be about selective printing and deleting of certain lines. Can you think of other text conversion and substitution procedures that I did not include here?